In this long-awaited conclusion to the Penderwicks series, which is set 15 years after the first book, the entire Penderwicks clan has returned to Arundel to celebrate Rosalind's wedding to Tommy Geiger. Lydia, the youngest Penderwick, is eleven years old, and is thrilled to finally visit the magical place that has been the subject of so many stories told by her now grown-up sisters, who range in age from 19 (Batty) to 27 (Rosalind). While wedding preparations unfold around her, Lydia befriends Alice, the daughter of Cagney Pelletier and his wife, Natalie, and the two girls do such things as flee from nosy Mrs. Tifton, whom Jeffrey did not consult before offering Arundel for the wedding, babysit the dog of Batty's ex-boyfriend, and take care of some chickens. 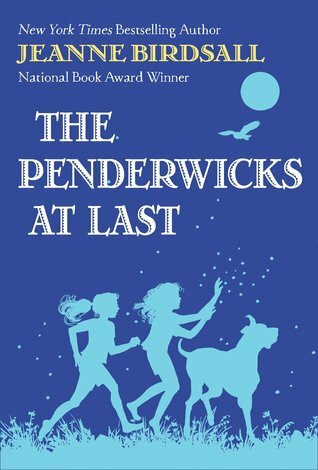 When I first read The Penderwicks nearly ten years ago, I gave it a very enthusiastic five stars. Here was a timeless book about sisters having adventures together, solving their own problems, and mostly looking out for one another. It was my exact cup of tea and I drank it down eagerly. The following sequels varied in quality: I liked The Penderwicks on Gardam Street, but found The Penderwicks at Point Mouette too contrived, and then enjoyed The Penderwicks in Spring, but felt it didn't match the tone of the first three books. This final book, however, is the biggest disappointment of the four sequels, and it sends the series out not with a bang, but with a whimper. The biggest problem, I think, is with the original four characters. In every book of the series prior to this one, one of the original four girls has still been young enough to take center stage as the protagonist of the story. Readers feel at home in those books because even though the characters are a bit older in each new title, readers have built up a relationship with those characters over the course of the series and have a vested interest in learning what happens to them. Because those beloved characters are now all adults in this book, they are suddenly just not that interesting. They all have adult worries about careers and marriage that kids just don't care about, and we are no longer inside any of their heads. Worse, because they have been kids in the previous books, their adult selves feel very hollow and inauthentic, as though only the most stereotypical vestiges of their personalities actually followed them to adulthood. I kept thinking about those obligatory sit-com episodes in which the characters imagine what they will be like in the future. The actors get dressed up as older versions of themselves, utter a few catchphrases from beneath their fake white wigs and everybody laughs at how silly they look and sound. As I read passages about the older Penderwick girls, I kept finding myself thinking that each one felt like she was pretending to be an adult and not doing a very believable job of it. In that sense, reading this book was like reading a book-length Harry Potter epilogue. Without a strong main character, and with the four original characters off to the sidelines posing as grown-ups, there is nothing to distract the reader from the usual tropes that appear in the other books of this series, which, in the past, have been made less annoying by the book's other good qualities. These include Mrs. Tifton's utterly stereotypical and incredible continuing disdain for the Penderwicks after essentially not seeing them for fifteen years, the sheer number of unnecessary characters, including Alice's brother and a host of dogs whose names are impossible to keep straight, and the last-minute decision by one of the other sisters to also get married along with Rosalind. Also problematic is the fact that the book spends all its time building up to a wedding, and then not one word is written about the actual wedding ceremony. I also absolutely hated the references to the "patriarchy." That gave the book a political flavor that was decidedly absent from the others of the series, and which is grossly inappropriate for the 8-to-12-year-old audience. All in all, this book is just one story too many about these characters. While it is nice to know what happened to them all as adults, it is not necessary to devote an entire book to explaining it. Honestly, a single chapter at the end of the fourth book which described the wedding would have done the trick - that even could have been from Lydia's point of view and it would have been a fun novelty instead of the major liability it is for this book. It was an interesting idea to have the characters age so much from book to book, especially since so many years went by between books, but I also think there is a reason more authors don't take this approach. This fizzling out at the end of the series was almost inevitable, simply because kids want to read about kids, not nostalgic adults who used to be the kids they loved to read about. I read the first book in the series and enjoyed it but never felt motivated to read any of the others. This does sound unfortunate and I can see where it would feel like most of the characters were children playing grownup. I think I'll pass on this one and keep my Penderwick sisters as they were in the first book!